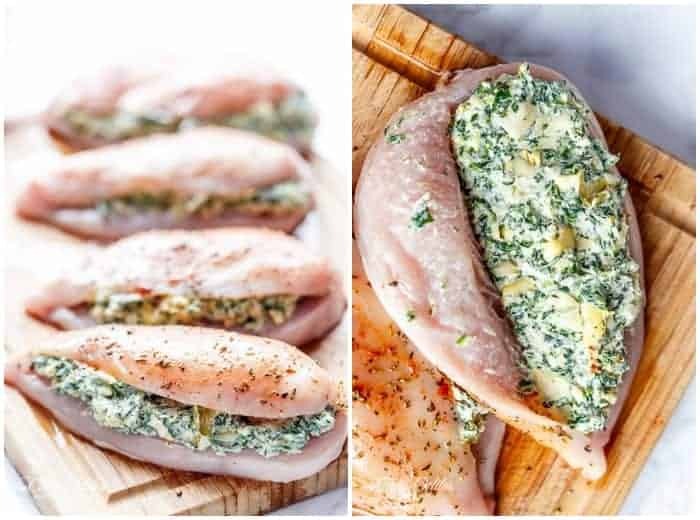 Spinach Artichoke Stuffed Chicken Breasts is a delicious way to turn a creamy dip into an incredible dinner. Serve with an optional cream sauce! 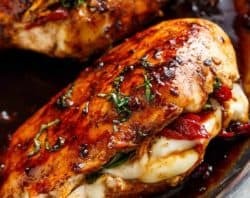 A low carb KETO approved winner of a chicken dinner, this Stuffed Chicken Breast Recipe has definitely won the family over! 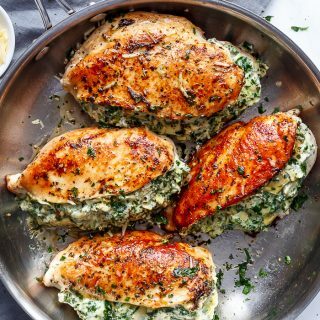 Extremely popular for a good reason, you’ll never want regular, plain old boneless chicken breasts again after trying these! What better way to enjoy chicken breasts than this? 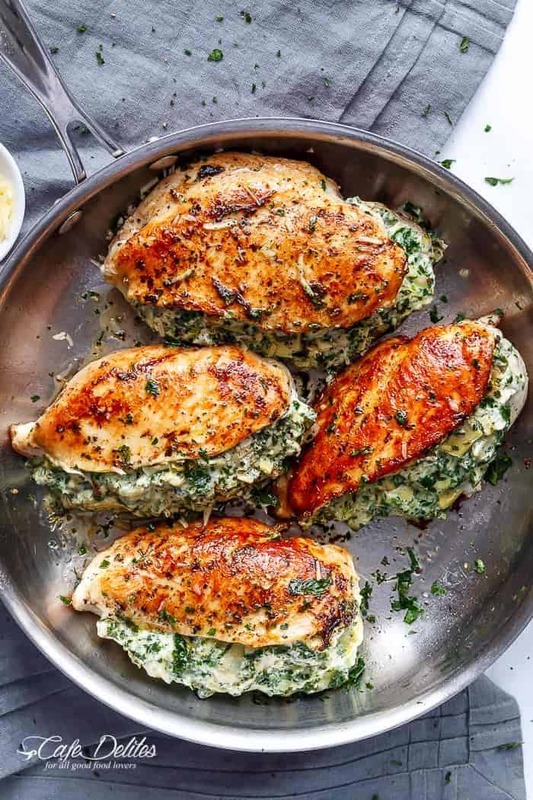 Stuffed Chicken Breasts WITH a creamy spinach and artichoke dip is a deliciously easy recipe idea, ready in around 30 minutes. 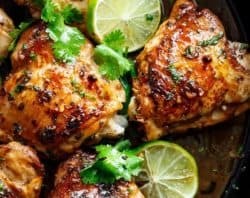 If you’re always on the look out for a different way to enjoy chicken, then this recipe is perfect for you! Slice through the middle, horizontally to create a ‘pocket’. Seal with toothpicks to ensure the dip stays in the chicken pockets (watch the video below). Cream cheese, mozzarella, parmesan, garlic, frozen (thawed) spinach and artichokes. If you’re not an artichoke fan, simply replace them with extra spinach. The dip needs to be nice and thick. Please don’t add any liquid to it as it thins out while cooking. Sear stuffed chicken breasts until golden and cooked through (about 6 to 7 minutes per side). For thicker chicken breasts, cover your pan with a lid for a further 5 minutes, or until no longer pink in the centre. In under 15 minutes, you have in front of you the most incredible tasting stuffed chicken. Amen. Serving your stuffed chicken breasts with the addition of a creamy dip/sauce takes this over the top. As always, It’s completely up to you. 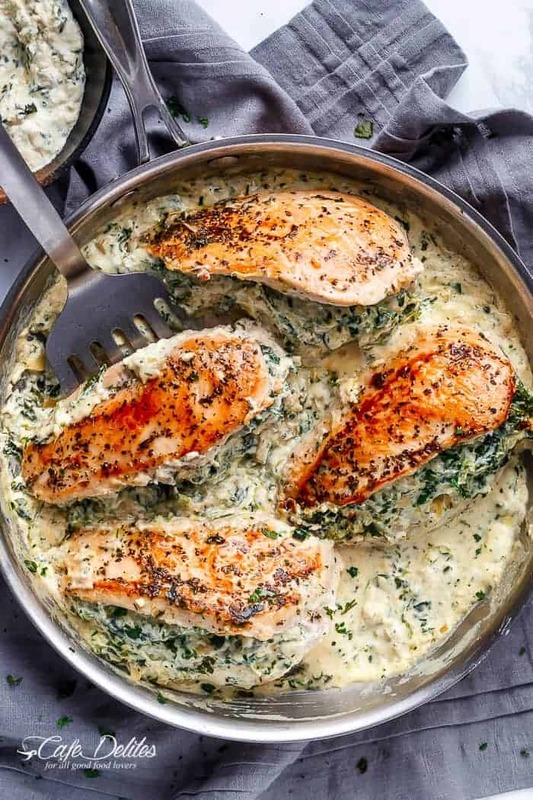 To make the extra sauce, just pour half and half or heavy cream into the skillet along with the remaining dip, and stir until the sauce is nice, thick and creamy. Smother the sauce all over your chicken, because really, WHO doesn’t like extra creamy dip? The added flavour explosion is unbeatable. Serve it with low carb options, like zucchini noodles or a buttery cauliflower mash. Or, for carb lovers, pasta and rice are incredible with this. 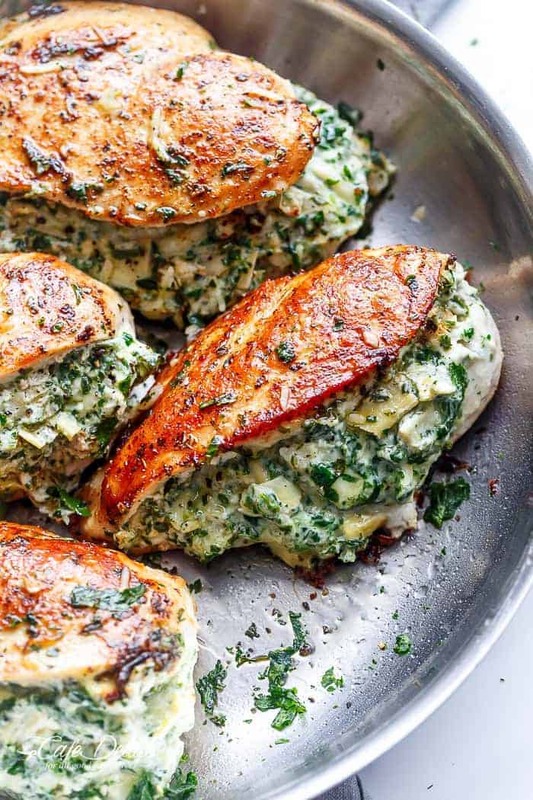 LOOKING FOR MORE STUFFED CHICKEN RECIPES? TRY THESE! 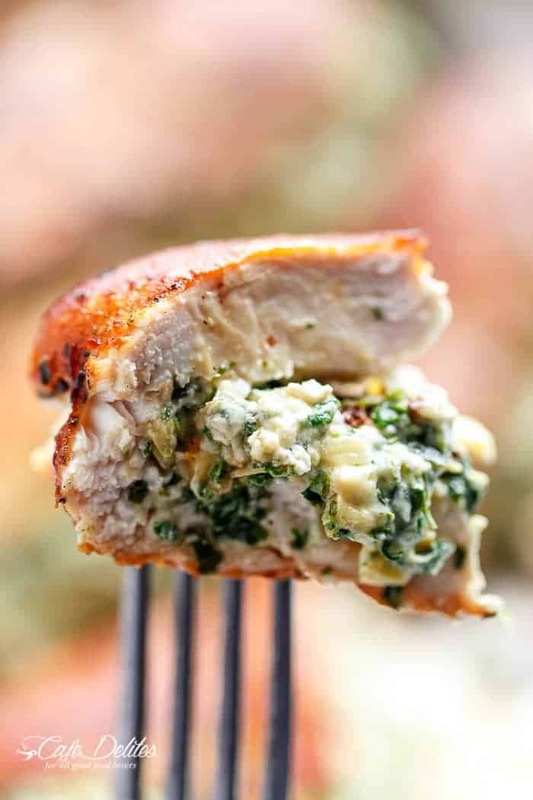 Spinach Artichoke Stuffed Chicken is a delicious way to turn a creamy dip into an incredible dinner! Serve it with a creamy sauce for added flavor! Place each chicken breast on a flat surface. Season both sides of each breast with the Italian seasoning and paprika. With your hand supporting each piece, cut a slit or pocket about 3/4 quarter of the way through, being careful not to cut all the way. Squeeze any and all excess liquid out of the spinach and discard the water. 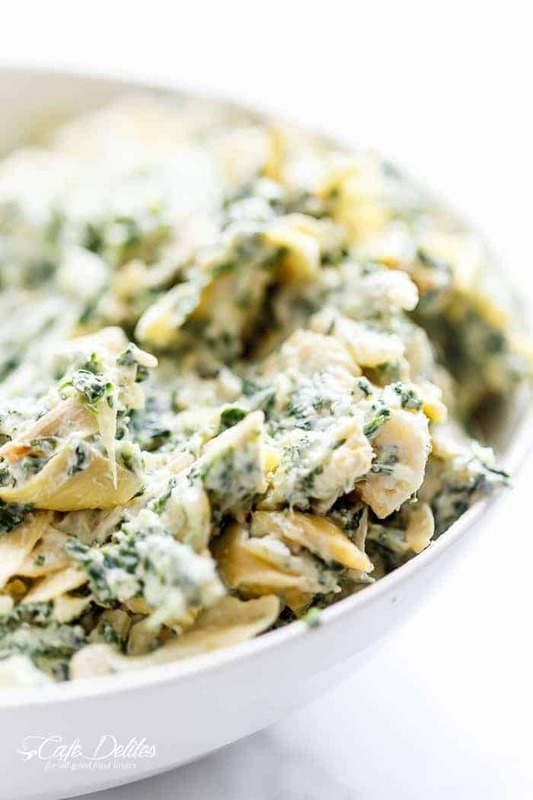 In a medium-sized bowl, combine the spinach, cream cheese, artichokes, mozzarella, parmesan and garlic; mix well to combine. Seal chicken breasts with two or three toothpicks near the opening to keep the dip inside while cooking. Heat 1 tablespoon of oil in a skillet or non stick pan over medium-high heat. Sear chicken until golden. Flip and sear on the other side, covering pan with a lid, until cooked through, (about 6 to 7 minutes per side). Transfer chicken to a warm plate to make the cream sauce. Combine half and half or heavy cream with the remaining dip (you should have exactly half remaining). Stir until sauce is combined and thickened. Add the chicken back into the pan and serve immediately! Don't like artichokes? Replace them with an extra 4 oz | 120 g of frozen and thawed spinach. *The cream sauce is optional! If you're not wanting to make it, HALVE the DIP ingredients in the ingredients list to ensure there is no leftover dip. If you're wanting to save the reserved dip for later instead of using it in a cream sauce, simply refrigerate it up to 4 days OR freeze up to 3 months in a plastic container. When ready to use, mix 1/2 cup milk or cream through to thin the consistency and reheat over medium-low heat. NUTRITION INFORMATION INCLUDES THE SAUCE! This looks so tasty! I will definitely need to try it soon. Yum yum yum! I made this about a week ago and it was soooo delicious. so good that I’ve been craving it and I’m going to make it again tonight. Thank you so much for your recipe! YES! Mary that’s awesome! The mushrooms sound incredible. I may just try it out myself haha. So great to keep a batch in the fridge ready and on call. Thank you for the idea! I made this recipe and the only thing different was that I added mushrooms instead of the artichokes and it was delicious!!! Making it again tonight!! 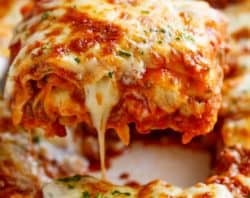 Ive made this twice already first time i just stuffed the breasts and made extra sauce to top it and the second time i make it with pasta and this time i want to try it in my slow cooker!!! Do you think i should add any liguid to my slow cooker or the chicken and sauce will add enough liquid as it cooks? I made a 1/4 recipe last week to see if I would like it when my wife was doing the monthly girls night out last week. It was great. I made it again tonight for my wife and mother-in-law. During the last 90 seconds I dumped 2 hand fulls of fresh baby spinach in the pan and added the cream dip. I ended up with about 4 servings of creamed spinach to go with the stuffed chicken. I also grilled corn on the cob as a side. It was a big hit. This was awesome. I added pecarino to mine. I seared the chicken and finished it in the oven. I did not add milk, once chicken was finished, removed it from the pan and added remaining dip until it was nice and creamy. My husband loved it. Can’t wait to have leftovers for lunch tomorrow. could you use a already prepared store bought spinach artichoke dip?? Thanks for sharing this delicious recipe. Made it today and will definitely be making again 😀 it also came out looking like your pictures I wish I could post it on here but it will be on fcebook 🙂 thank you!! AW! Thank you so much! I am so happy that you loved it and you are sharing with! Thank you for sharing and following along with me! excellent recipe , did not have cream cheese but had goat cheese turned out excellent. I used chicken broth instead of milk to thin the sauce (because somebody drank all the milk on hand). Delish! Next time (and there will be a next time), Ithink rather than trying to cook stuffed breasts I’ll just cut the breasts into bite size pieces, season and brown them, then add the filling/sauce. This was soooo good! I’ve made this recipe twice now. It has become one of my favorite chicken dishes. The last time I made it I marinated the chicken overnight in Marsala wine. Delish! MMM!! That sounds delish! I am so glad that it turned out for you! Thanks for sharing! I am by no means an experienced cook.. I never had to cook at all until the last few months after being seperated , but being the father of 2 teenage sons that love to eat I had no choice but to figure ir out. I made this recepie last night and it was amazing and got 2 thumbs up from my boys, The devoured this dish.. 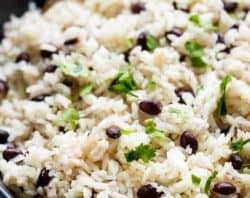 Thank you for making the directions so simple and easy to follow..The more I cook using your recepies the more comfortable cooking, it no longer feels like a dangerous science experiment It also feels great to be able to cook nice meals that are healthy choices for the kids and mysef !!! That is great to hear! Thanks so much for following along with me! I am so glad that you are finding it more and more comfortable in the kitchen. Best of luck! You are a great mum! How long could it hold up in the fridge, I had lots of leftovers. It was amazing. This chicken will last a few days in the fridge. That is great that it tasted so good and you have leftovers for this week! Win-Win! Enjoy! I’m not a cook, I had never been a big fan of cooking. However, recently I just felt like I really wanted to cook. 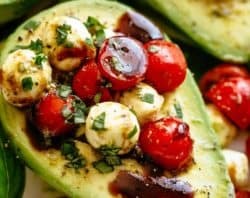 After researching a few recipes and trying a few other ones from other websites I found this page! And boy!! Are my husband, kids, and myself happy for that?!? Your recipes are amongst the best, and this one is our number one! 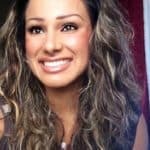 I took the liberty of sharing the link on FB (w/ my own pics), and thinking no one was really paying attention a few days later my cousin said she tried it and it was also a hit with her family. Thanks for sharing!!! AWE! Thanks so much! That is so very kind of you hun! I am so glad that you found my site and that I could be of help to you! Thanks for following along with me! Let me know if you have any questions or help too! I made this with my dad and we had such a great time. That is great you made it your own! I love all your ideas and the way you changed it! Thanks so much for sharing! My boyfriend and I love veggie sides. What kind of veggies do you think pair well with this dish? This is amazing. If I had not already prepared dinner, thus for sure would be on the table. Thanks! I am looking forward to trying this recipe out on my family, my mom and I are trying this tandem cooking expirement where I prep and she cooks it later. I believe this recipe is simple enough to be able to do that! Just wondering what would be a good side dish this could be served with? Hi Jo! I normally serve this with mashed potatoes! I made this for dinner guests and it was a hit! But I have a question — is there a way that I can bake this instead? Perhaps I can sear each side first and then bake it? This way I can be with my guests entertaining them (while the chicken is baking) instead of in the kitchen (on the stove) and leaving my guests for 20 minutes. I appreciate your help! I made this for dinner tonight – quick, easy, beautiful and YUM-O! I served with Apricot Glazed Carrots which made for a very pretty and colorful plate. THIS will definitely be in our rotation! Thank you for sharing. ps We didn’t have skimmed milk but had light cream, so I used that for the sauce. Probably another gazillion calories, but…smile! I’m so happy to hear that! Thank you so much for sharing your feedback! having a hard time getting chicken cooked all the way! Anyone with oven results? Hi Jen! Preheat your oven to 2o0°C or 400°F. Once you have seared you chicken in your skillet on both sides, transfer them to the oven and continue cooking until cooked right through. I usually go by the thickness of your fillets. Anywhere form 10 minutes to 15 minutes should do it without drying out your chicken too much! Made this tonight, it was great! Will make again. Fast, easy and delicious. We added mushrooms to the sauce and liked it. Do I cook spinach first if using fresh ? I just made this for dinner tonight, and it was absolutely delicious! I substituted Neufchatel cheese for the cream cheese and did not make the cream sauce. My hubby and I loved it. Because there are only two of us, I cut the recipe in half and had no problems. I served this recipe with roasted whole carrots and leftover homemade mashed potatoes! Can I prep and freeze? How long to cook in oven? How long in oven instead? I made this, it was fantastic. I am happy to have a new company worthy recipe that is quick, easy and made with ingredients I can keep on hand. Next time I will slice the chicken a little deeper than Idid this time, it will give more room for the stuffing and make for an even nicer presentation. I made it without the cream sauce and did miss it. I’m definitely making this for dinner tonight! Does the nutrition info include the cream sauce, or is it just the chicken after it is prepared? Thank you! This is amazing and easy!! Made stuffed pork chops using the spinach recipe. Soooo good! I just made this tonight! It was amazing. I substituted the milk and the sauce with whole whipping cream and water for consistency and to cut down on the sugars and carbs. In your nutrition facts how many grams of carbs and sugars come from the cup of milk that it calls for?? 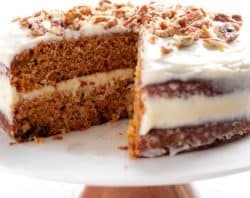 Amazing and excellent recipe! Thank you so much for posting. I used low fat cream cheese and it was absolutely wonderful. This looks yummy! I’m def gonna try making this. If I make the cream sauce though you think I can substitute with almond milk instead? Hi Kristin. Almond milk should work. I’d heat the cream cheese mixture first then slowly add the almond milk until reaching a good consistency. I’m just not sure about flavour? OOOOOOOOOOOOOOOOOOohhhhhhhhh MY! I am admittedly, a terrible cook. I found this recipe, and thought to myself, UGH… I hate artichokes… they are so slimy… and the Italian spice, yeah, not fond of that either. This recipe was THE BOMB! I asked the hubs if he liked it… he looks down at his place and says, “You can’t tell?!?! ?” My thoughts were coming out in gasps…. OH SO GOOD! Thank you for this recipe. I will be looking for more from you! Next I am going to try your peppermint patties. My hubs told me the other day that he loved Thin Mints (Girl Scouts) He had to go back for another box because the first one didn’t work! hahaha… I am going to surprise him, hopefully with your version of peppermint patties. p.s. I loved that the chicken dist was also gluten free… I am a naughty girl and have eaten breads etc, and have been so sick from it… I wish I had more will power… Maybe now if I can find more recipes, it will help me get on track! Thank you again!!!! This was delicious and very easy to prepare. I will definitely make it again. I can’t wait to try your other recipes. I loved this recipe. Following a Low Carb High Fat diet and was having an intense spinach dip craving. This exactly hit the spot!! I served it with cauliflower rice. Saved a little of the sauce to have on poached eggs and spinach tomorrow. Thank you so much!!! I have a question. Do I cook the spinach first if I am using fresh spinach? Just made this tonight for dinner. Smells delicious, looks so pretty and I’m excited to see what my family thInks!!! I don’t have an instagram account but after reading a post from another reader, I’ll be downloading it just so I can follow your page!!! I made it with fettuccini noodles for my hubby and daughter (they look at me crazy when I try to push extra healthy meals on them) and I made mine with spiralized zuccini noodles…..DISH WAS ABSOLUTELY DELICIOUS ?? Made this recipe this past weekend, everyone enjoyed it. Will definitely make it again. Delicious! Me and my husband loved it! He couldn’t wait a full week for me to make it again! Janice you are very welcome!!! I’m so happy to hear that ? Anything that makes spinach artichoke dip into a meal has GOT to be good! I will be trying this soon! Thank you! What pan are you cooking this in? Yum! Can I bake this instead? If so, for how long (1-2 hours at 350?) Thanks! I made this the other night and it was so delicious! My family loved it. I didn’t have any Italian seasoning to use but the meal was so good i’ll probably make it again without. My husband and I even used the dip on nachos after all the chicken was eaten. 1). In my country it almost impossible to find Italian seasoning, I read on Wikipedia that its main constituents are garlic, oregano, Rosemarie, and thyme. Does it work if i made it by myself from the ingredients i have mentioned? 2). Another problem is the parmesan i cnt have it? Is there any other kind of cheese i can use? This was delicious and pretty easy to prepare. Even my picky-eater son loved this! I served it without the cream sauce with jasmine rice.